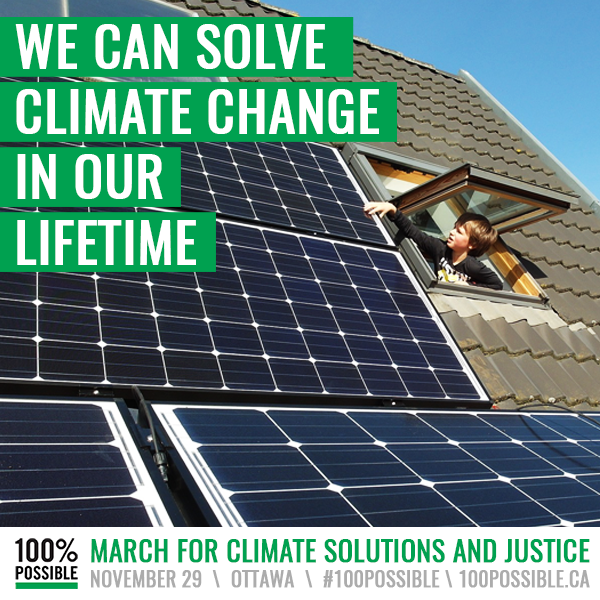 Why support the March for Climate Solutions and Justice in Ottawa on Sunday, Nov. 29, 2015? Encourage more municipal and provincial governments and companies, following on the example of Vancouver and other jurisdictions, to commit to 100% renewable energy by 2050. Bring together people from all walks of life, including through groups such as Ecology Ottawa, Ottawa Riverkeeper, Climate Action Network, WWF Canada, Nobel Women’s Initiative, Ontario Secondary School Teachers’ Federation and dozens of others, in a call for sustainability and justice. Things will get going around noon on Sunday at Ottawa City Hall (110 Laurier Ave. W.), with music, food trucks and more. The opening ceremony, including David Suzuki and other speakers, starts at 1 p.m. People will begin walking to Parliament Hill at 1:30 p.m., with closing speeches by youth around 2:30 p.m. Organizers are asking people to wear green. Check here for details and updates. There have been climate marches–and international climate conferences–before, but there’s every reason to believe a broader array of governments, citizens, organizations and businesses are coming together to make renewable energy happen. If you need additional reasons to attend, read this. If you can’t attend, talk about the March, the issues and the solutions with your friends and neighbours. Share your support on social media. Write your MP.